Angie Thompson Sport Horses - Busy Few Weeks. We had a busy week which started with Cheshire County on Tuesday 17th followed by a long journey that evening straight down to Hand Equestrian Centre for their 5 day show. I had another unlucky HOYS class at Cheshire County where Balou jumped fantastic but just missed out on qualifying HOYS by one place again! Jubilee III jumped really well and we ended up taking 5th place in their Area Trial which was great as I'm still getting to know her. We had quite a few placing at Hand and all the horses jumped some great rounds. 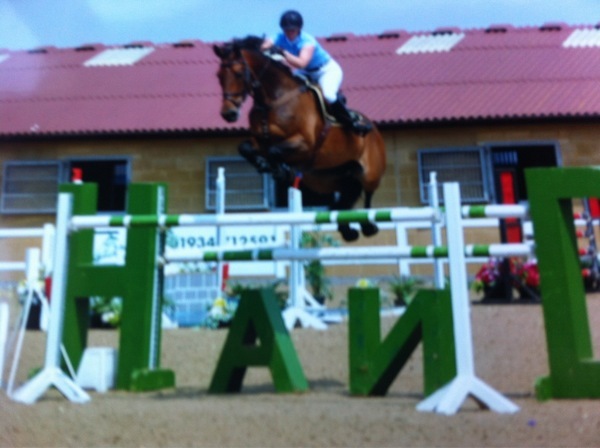 I did have a number of unlucky 4 fault rounds but that's just showjumping! The Best result was with Jane Dixon's 7 yr old Calvaro B who jumped an amazing triple clear to finish 3rd in the Hoys Foxhunter qualifier. The last round was up to 1.55m in height and was the toughest task he has ever had to cope with. He is so scopey and jumped it easily. We were so delighted with his performance even though we missed out on HOYS by one place again!